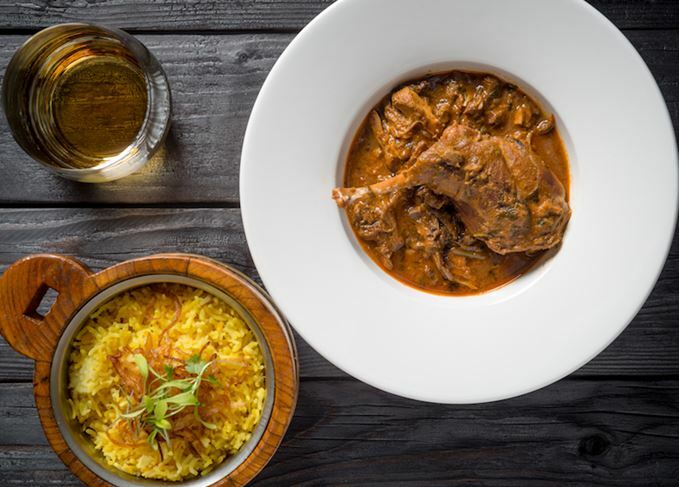 A new wave of Indian restaurants in the UK is moving beyond chicken tikka masala and lager to embrace a more innovative approach to food – with whisky an increasingly popular pairing. Emma Eversham reports. Ask someone what alcoholic drink they choose to partner their curry and the response is likely to be lager. And who can blame them? Indian food's reliance on spice and heat typically makes it a tough cuisine to partner with anything that has a higher level of alcohol, acidity, tannin or flavour. A clean, crisp beer is usually the safe option. And yet, believe it or not, spirits are more frequently drunk with food than lager in India, which is one of the reasons why so many Indian chefs and restaurateurs are intent on encouraging us Brits to change our drinking habits when we frequent their restaurants. ‘This almost religious obsession that Indian cuisine only works with lager has baffled us for very long, ever since we came to Britain,’ says chef and restaurateur Cyrus Todiwala, who opened his first UK restaurant, Café Spice Namaste, on the edge of London's East End 22 years ago. At Café Spice Namaste wine sales are up 300% due to promotional work, and Todiwala hopes to see whisky take a similar route. Over the last few years the chef, a regular face on the Saturday Kitchen television programme, has worked directly with distilleries, as well as with the Scotch Malt Whisky Society, to host whisky pairing evenings. Such has been their success that more are being planned: next January will see Burns Night events at Café Spice Namaste, and at Mr Todiwala’s Kitchen, the restaurant at Hilton London Heathrow Airport. Meanwhile, Todiwala will head to the Isle of Mull to hold an event with Balvenie in March. ‘They are very popular and a challenge, both for me as a chef and for the attendees – ultimately, they provide their verdict on whether a great single malt or blended whisky can work hand-in-hand with spices and various combinations of fine Indian cuisine,’ he explains. Todiwala is one of a number of Indian chefs and restaurateurs who are keen to highlight Scotch whisky's suitability to spice. In October, the popular Michelin-starred Mayfair restaurant Gymkhana held an event in partnership with Johnnie Walker, where whisky cocktails were paired with dishes such as cafreal grouse with kall dosa, and wild muntjac biryani, on a four-course Hunters Feasting Menu. Commercial Street’s Gul and Sepoy, launched in September and the third Indian restaurant opened in London by Harneet and Devina Baweja in as many years, is also offering selected whisky pairings to accompany its new lunchtime feasting menu. It features regional specialities of India's South West coast, like three bird awadhi korma or whole tandoori sea bream with pickled black radish and burnt achari cauliflower potato. Another restaurant taking Scotch seriously is The Cinnamon Club, the Westminster-based fine dining restaurant overseen by executive chef Vivek Singh. The restaurant lists 39 whiskies, 19 of them single malts, and has hosted numerous tasting events. However, its forward-thinking bar manager Nick Smith is keen to see more of the whiskies imbibed alongside dinner, as well as in the form of aperitifs or digestifs. Smith finds that the smoky notes found in many Highland whiskies typically work well with Indian spiced dishes, particularly those incorporating cinnamon and cloves, while heavily peated Islay whiskies partner well with meat, fish and seafood cooked in the tandoor. While whisky can complement flavours within a dish, the high alcohol content is also a useful tool for cutting through the richness of the food, Smith argues. He also recommends adding a drop of water or ice to open out the whisky for those concerned about acidity. ‘They just cut through one another and mellow each other out,’ he enthuses. Todiwala agrees that whisky and spices can complement one another, rather than fighting for space. ‘Spices do well as they allow the whisky to be overpowered in the mouth, and then ease back as the spice disappears and the whisky comes through,’ he says. Balance and constant testing are the keys to the perfect match, suggests Todiwala. The wrong choice can cause too much acidity, he warns, while the assumption that a whisky will be the same year after year could also throw off the perfect match. As Todiwala hints, Indian food and whisky pairing is in an evolutionary state. Restaurants are continuing to experiment and educate in the hope that diners will see the light. Rare breed Galician beef with your Mortlach? London members’ bar uses Scotch in new ‘duets’ menu. Restaurant critic Jay Rayner gives Dave Broom food for thought on whisky writing.